5/11 Cup of Coffee: It was a split result on Tuesday down on the farm. 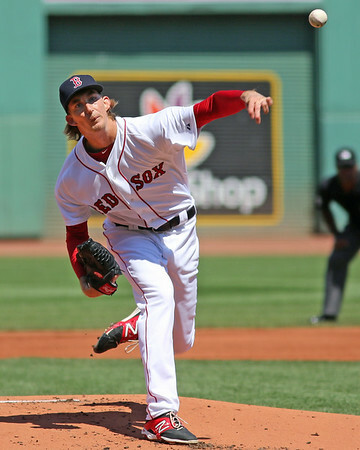 Henry Owens (pictured, right) and Noe Ramirez combined on a shutout for the PawSox, while a trio of relievers dominated in Salem's comeback win. A Greenville rally fell just short after Anderson Espinoza was knocked out early, and Portland dropped its second straight contest in Manchester, N.H.
Back with the PawSox after a three-start cameo in the big leagues, Henry Owens showed both the unhittable stuff that got him to the majors and the control issues that landed him back in Triple-A. The 6-foot-7 lefty fired seven shutout innings, allowing only four hits while striking out five. He lowered his ERA to a microscopic 0.72 in his four PawSox starts. However, he issued another five walks, giving him 28 in 37 1/3 innings between the two levels. Noe Ramirez picked up the save, tossing two scoreless innings. Ramirez surrendered three hits and struck out three without walking a batter. 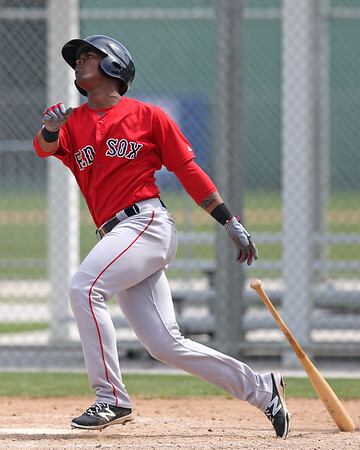 Rusney Castillo led the way at the plate, going 3 for 4 with a double and two runs scored. Jantzen Witte and Marco Hernandez added two hits apiece. Perhaps the most surprising moment of the day was the ninth-inning triple off the bat of Sandy Leon. It was Leon's first triple since March 28, 2013, when he was a member of the Double-A Harrisburg Senators. It was a tough night across the board for the Sea Dogs, who allowed 13 hits, accumulated only six of their own, and committed five errors. The uneven defense led to extra work for Portland starter Ty Buttrey. The right-hander needed 87 pitches to get through 4 2/3 innings. Two of the six runs he allowed were unearned, and he struck out three without walking a batter. Tim Roberson had two of Portland's six hits, but also committed two errors. Wendell Rijo had a pair of miscues as well, while going 1 for 3 with a double. After falling behind, 3-0, in the early going, Salem chipped away and came out with another victory. The winning hit came off the bat of the white-hot Yoan Moncada. The 20-year old ripped a two-out single in the bottom of the eighth to score Jordan Betts, putting the Sox on top. Moncada had doubled and scored earlier in the contest, and he is now hitting .345/.457/.793 in eight May games. A strong showing by the bullpen picked up starter Dedgar Jimenez, who struggled with his control. Jimenez walked five and hit a batter in his four innings of work. Overall, he surrendered three runs on five hits and struck out two. German Taveras followed and was outstanding, firing three hitless innings of relief, striking out three and walking one. Yankory Pimental submitted a scoreless eighth inning to get credit for the win. Pimentel struck out one and gave up a hit. Jake Drehoff got the save with a perfect ninth. Anderson Espinoza turned in the shortest outing of his young professional career, lasting only 1 2/3 and taking the loss. He allowed two runs on three hits, and ran his pitch count to 57 thanks to three walks and three strikeouts. Columbia continued to feast on Greenville pitching, adding three runs against Victor Diaz and two more against Austin Glorius, building a 7-0 lead in the seventh inning. The insurance runs proved critical, as the Drive fell only a single run short of pulling off a stunning comeback. Mitchell Gunsolus put a major dent in the deficit in the bottom of the seventh with a grand slam, his fourth home run of the season. The Drive loaded the bases again in the bottom of the ninth, and Kyri Washington delivered a two-run single that put the tying run in scoring position. However, Alex Palsha (NYM) was able to induce an Austin Rei ground ball to smother the rally. Joseph Monge (pictured, left) was a catalyst in both rallies, twice walking and scoring. Monge had previously walked and doubled in the game. Anyelo Leclerc did his part on the mound, keeping the game within reach with two perfect innings of relief. Player of the Day: It was a big afternoon for Joseph Monge, who reached base four times as part of Greenville's attempted rally. Monge has found his second go-around in the South Atlantic League to his liking. He struggled to a .241/.287/.335 line in his first season with the Drive. He has improved that to .326/.400/.446 through 25 games in 2016.